DST Investments are a good option for baby boomers who have invested in property for the sake of retirement, but understanding what DSTs are and how they work takes the experience and insight of an expert on this facet of the 1031 exchange process. 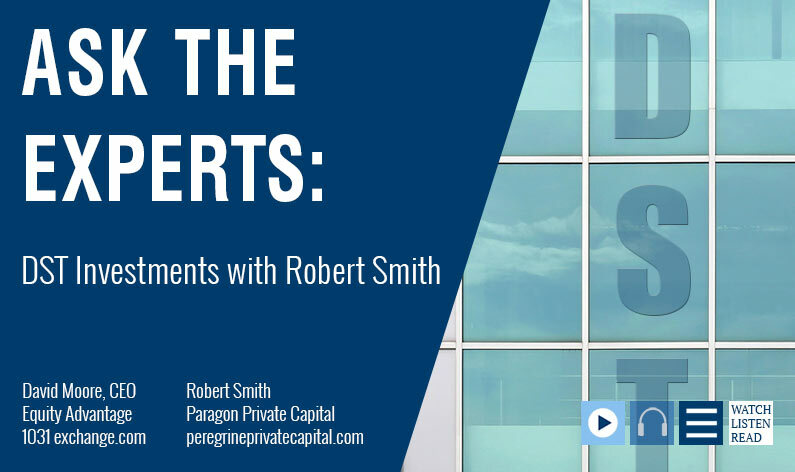 In this episode of Ask the Experts, David Moore of Equity Advantage welcomes guest and DST expert, Robert Smith of Paragon Private Capital, to talk through the ins and outs of this type of investment. David Moore with Equity Advantage and I’ve got the pleasure of having Robert Smith, Paragon Private Capital, here today. And we’re going to be talking about DSTs. Bob’s been handling DST investments for several decades now and he’s considered to be one of the monsters of that world and very well-respected. And today we want to get some of your wisdom out to our investors. So, why don’t you start off to explain a DST, how it came to be, and why people might actually want something like that. Robert Smith: DST, as such, has been around for about 20 years. It’s been part of the 1031 exchange process since the late 90s. Because it’s a Reg D security, awareness of it remains relatively low because there’s a probation place against advertising, solicitations. So, you’re not going to see an ad for DSTs in the Wall Street Journal or Forbes magazine like you do, Vanguard Mutual Funds. That being said, they now make up about 10 percent of properties used in 1031 exchange on the backend. And the reason for that is very, very simple. It’s almost exclusively a demographically-driven phenomenon, meaning the population’s getting older. I’ll go off-script a little bit here and admit that I’m 63 years old. And as such, I am at the tail-end of the baby boom generation. David Moore: They like to consume things. Robert Smith: They like to consume things. Yeah, they like to consume things and they like to take care of themselves. So, what you have now is this big demographic block reaching retirement age, and they have demonstrably less energy now than they had when they were young. As anybody that owns real estate knows, managing your own dirt in your 20s, 30s, 40s, even your 50s is fine. It’s not so fine in your 60s, 70s, and 80s. And so, that’s the demography deriving demand for DST properties. Because people who have built wealth in real estate over their lifetime, they know the asset class, they’re comfortable with the asset class. And because of 1031 exchange, they’ve been able to avoid capital gains, tax liability, almost all of it. David Moore: We don’t like the word “avoid”. Defer, defer. We don’t talk about this word. Just What is a DST? David Moore: So, Bob the DST, and it’s just something we live with. So, we understand what it is and all, but just for the audience would you mind telling us what a typical DST might look like. I mean, what is this thing? I know it’s been sort of cluttered because there’s a whole other product that now has decided they want to call their product DST, also. And it’s something that’s totally different than what you work with day and day out. Robert Smith: Right. DST is just short for Delaware Statutory Trust, and all that is, is the legal format within which the property or properties, which are remotely managed or owned. And in a nutshell, what DSTs are anymore, they are small real estate investment trusts out of the nod to the fully-priced nature of commercial real estate now. Most individual DST programs will come with multiple properties inside them. If it’s an apartment DST, they’ll have three or four separate free-standing apartments. If it’s a medical office building, same thing. Three or four separate, free-standing medical properties. David Moore: So, it sounds like you’ve got the ability to diversify without having to diversify. I mean, you’re buying an asset that has multiple properties so you’re getting some separation, some stability of multiple assets with this single investment. Robert Smith: Yeah, it’s actually that I think is the strongest argument for DST at our current place in the market pricing cycle. Because we’ve obviously had unprecedented appreciation in real estate over the last 10 years driven by the zero-interest rate environment. That obviously now is changing, with rates going up. And so, to avoid overpaying for a single property on the backend, we think your best edge is to diversify over multiple properties on the backend of your exchange. And that’s what the DST allows you to do from the structural standpoint. I assume the individual DST programs or internally in the DST themselves with multiple properties rather than one. David Moore: So, you were talking about people that buy into it. What we’re talking about I would sort of define it as, like you said, a mini “REIT.” I mean, the bottom line is the real estate investment trust, you cannot exchange into. You can exchange into something called “up REIT” but those aren’t offered that often. And you do offer those. But the problem with the REIT product is you can get into it, you just can’t get out. Where the DST, you can exchange in and you can exchange out in the future when it matures. Which I guess sort of leads me to the next thing, I guess. If we look at the people who buy into these things, they’re great and often it’s a situation where it’s an end-game for somebody, or the other thing is a fallback for somebody. In today’s market it’s a great time to sell things. It’s hard to find what you want so you might fill a gap there, that last piece of investment. Somebody buys something, and they’ve got some money left, you provide that opportunity for people, but the DST product is great because you’re looking at sort of a mini REIT. You’ve got some diversification. You’ve got to go again, get in, get out. David Moore: The DST product versus a TIC, a Tenants In Common. I’ll just put it out there that the whole TIC world got sort of blown up during the crash. I don’t look at it as a TIC. The structure is the problem. Obviously, there’s the sponsors and there’s a result in marketplace at that point in time. Let’s just compare and contrast, real quickly the TIC versus a DST. Robert Smith: The DST is infinitely fundable because there isn’t a limit in terms of the number of investors, practically speaking, that you could have any one DST. You can pretty much slice it and dice it, whatever way you want. As an investor, you can put in as little equity or as much equity as you want. Whereas, TIC programs back then tended to concentrate assets in an individual property, and obviously concentration of assets increases risk rather than diversification of assets, which decreases risk. And at that time, 2008 was an anomaly because the housing market was so terribly, terribly over heated that exchange demand was just off the charts. And if we had a good program coming to market, say a 20, 30-million-dollar equity raise from property standpoint, it would be sold out, fully subscribed the first day it hit the street with 20 million dollars in backlog from orders standpoint. So, what that did was attracted bad actors into the space. Any hot money environment, whether it’s real estate, internet stocks, Bitcoin, or what have you always attracts bad actors. There were over 100 different property providers in 2008. Most of them were opportunistic. David Moore: How many are there today? Robert Smith: Well, active? About 30. It’s a much, much, much better police space from the oversight standpoint now than ever. David Moore: So, of that 30, how many were there before the crash? And you’re saying this market’s starting to get filled up again today, sort of a rehash of what happened before. Robert Smith: Yes, and it’s creepy as hell. David Moore: Back to my initial question, how many of the initial group are here today and what are you seeing happening right now in this space? Robert Smith: The same thing, albeit to a lesser extent. Of that crop of 30 or that group 30 property providers in the DST space currently, only three or present or extant prior to 2008. The Inland group, which is the 800-pound gorilla in the DST space was 60 percent market share. PASCO, which is number 2 with about a 25 percent market share. That’s 85 percent of the DST market there. Two companies. And then a small, albeit very, very high-quality company out of Neapolis called AEI that’s been bringing all cash programs to market forever. David Moore: So, it’s hard to have a problem or loss. While you might have a loss of value it’s hard to have a loss of a property if there’s no debt on it. As we were talking about it in another video recently. Robert Smith: I’ll say this unlike other real estate, it’s all cash. David Moore: While we are on the topic of leverage, I moved to Oregon from California and I need to buy property. And at that point in time, my brother and I were partners and we just looked at the market. And hey, the higher the leverage the better. We didn’t really care. We were young guys, and if there was a problem with stuff we deal with it. I’m a little older than I was, and hopefully I’m a little bit wiser. I know I’ve been kicked in the head a few times. I always jokingly say I’m happy to be older, and I’m getting tired of being taught things. But if you look at stuff and you look at that leverage, obviously young, you’re going to be higher LTVs, and as you get older you’re probably going to be more conservative unless you’re some wild man out there. But if you look at LTVs, loan to value on assets, and if we look at what products you are able to actually sell what is the typical loan to value or what is the range? If somebody had a situation where unfortunately, we had some foreclosure transactions with phantom gains where we’re talking dead over basis, triggering the tax. On a home, you’ve got some tax relief, but on investment properties, you don’t. I know you have some product out there where you can get pretty high leverage for that person that just needs to get something. Robert Smith: That’s a very, very good point. Particularly, given as we discussed earlier, the older nature of the DST investor population. Leverage on DSTs tends to be lower by commercial real estate standards. Meaning, most DST product will be leveraged anywhere between 40 and 50, 55 percent. And historically, that’s a fairly conservative level of leverage or debt for commercial property. That being said, there are people coming out of distress situations, pre-2008, that need more leverage rather than less. To that end, and I’ll brag a little bit, at my urging the Inland Group created what’s called a Zero Coupon DST. And works just like a zero-coupon bond. It’s a very, very high-quality credit tenant like a portfolio of Walgreens stores. We just did the headquarters building for Zurich American Insurance Company of North America. And it will be 80, 81, 82 percent leverage. And, but like a zero-coupon bond, instead of the rents being paid out monthly to investors, the rents are paid into the product itself, paying down the mortgage debt in a very, very aggressive fashion. So, by buying or taking bits and pieces of a product like that, an individual in extremis that needs to add leverage to his or her equation to avoid a significant tax liability can very easily avail themselves of that product, and that’s something that I think is unique to the DST. David Moore: No, that’s great. I know we’re had some clients going in just to pick up that balance the remaining piece they needed, and you’ve been able to take care of that, so that’s great. So, if you look at the DST product and you look at the upsides we’ve been talking about, all the pluses of the stuff, is there a downside to them? Robert Smith: The only minus issue, is liquidity. Because it’s commercial real estate. It’s direct ownership in dirt. And as everybody that’s owned and managed it knows it’s expensive to buy dirt. It’s expensive to sell it. So, unless you’re really, really, really, really in the right place at the right time, you’re going to own it for a while. So, it’s an inherently illiquid asset. It’s not like picking up the phone, buying a thousand shares of Amazon. Today, I change my mind. I sell it to more or others, there’s a check in my account. You’re going to have it for a while so the liquidity or the liquidity event is an issue in terms of how long you’re going to own this asset. The historic ownership average for DSTs the last 20 years has been six years. It can be shorter than that. It can be longer than that, depending on market conditions. The decision to sell any DST is always opportunistic. It’s always market-driven. But interesting enough, everyone, when they’re going into a DST, their principal concern is “Well, how do I get out of this?” But what’s fascinating, because they’re doing it because they want to disengage and have someone manage all their assets for them, remotely they want to go from the “I manage managers or manage property” to the mail-box money business. And once they get in it and it’s working, the last thing they want to do is sell the property. So, we run into more opposition when it comes time to sell a property, even though we have significant appreciation built up in it and can show our investors mid-high teens internal rates return. People are familiar with it. They’re comfortable with it. And they usually don’t want to sell it. But you’ve got, as far as product, it seems like there’s always product available somewhere as far as different asset types. I mean basically for lack of better term, we’ll call it “the food group”, whether it’s multi-family or office industrial or region or whatever it is. And regionally, your sponsors probably try to keep things geographically in a state so you’re not having to file multiple tax returns. Is that the case? Robert Smith: That is exactly the case. There was an excellent article or editorial in the Wall Street Journal that talked about two weeks ago written by Arthur Laffer, the famous economist, the author of Laffer Curve, basically the creator of Reaganomics. He made the point that the new tax reform is going to take that steady movement or trickle of people and money out of high tax, high regulatory threshold blue states into low-tax or no tax low regulatory threshold red states and turn it into a flood. That because the new tax bills caps your state tax deductibility on your federal form at 10 percent. That’s going to accelerate all these high net worth individuals and businesses, leaving places like California and New York, and going to places like Arizona, Texas, Florida. So, you’ll see the majority of DST product in those areas, what we call “smile states.” which are the best from tax standpoint and the best from business standpoint simply because they’re experiencing the strongest growth in the United States. Big article today about it. David Moore: See, there you go. The little nugget of knowledge. I always talk about these things. You don’t have to know everything. You just got to have those little nuggets of knowledge. So, Bob. I just want to thank you very much for coming to join us today. Is there anything else you’d like to sort of add in at the end here? I think that was a great little piece of knowledge I didn’t have. And I didn’t have to get kicked in the head to get it, so. I appreciate that. Once again, Robert Smith, Paragon Private Capital, and he’s handling these things for a number of years and does a fine job with it. Anything you’d like to add? Robert Smith: I’d just like to thank you for the opportunity to participate in this. David Moore: Well, we’ll do it again and if you’ve got questions, please don’t hesitate to holler and let us know when you’ve got questions on, we’ll be happy to address them in a video in the future. Thank you very much. And we look forward to speaking and working with you soon. Thank you. Solutions like DSTs require the knowledge of informed experts to protect your investments. Give Robert Smith of Paragon Private Capital a call today to ensure you make the best decisions for your future. Call the team at Equity Advantage today and get the best advice about how to protect your financial future with DST Investments: 503-635-1031. Only the experts can give you the piece of mind you need when navigating the complexities of this type of 1031 exchange.